Napolitano and Peña discussed the Snowden leaks amid border security talks in July. This post was co-authored by Michael Evans and Jesse Franzblau and was first published on Migration Declassified. Just three months ago, Mexico wanted to “put to bed” bilateral tensions arising from the leak of sensitive intelligence information indicating that the U.S. National Security Agency (NSA) spied on Mexican citizens. 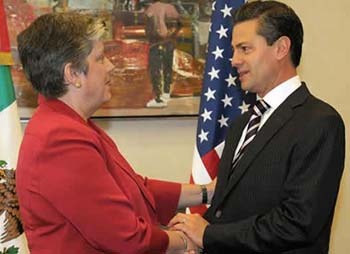 The new information was discovered by the non-governmental National Security Archive among a set of declassified briefing papers prepared for Janet Napolitano, then secretary of the U.S. Department of Homeland Security (DHS), in advance of her July 2013 meetings with President Enrique Peña Nieto and other Mexican officials. The document comes just a few days after the latest disclosures from a cache of secret documents leaked to journalists by former NSA contractor Edward Snowden earlier this year. On Sunday, the German magazine Der Spiegel reported that in 2010 the NSA succeeded in accessing the email account of Mexican president Felipe Calderón (2006-2012). In the days since these latest revelations, the Mexican government has sharpened its rhetoric considerably in opposition to the NSA spying program. The first Snowden leaks involving Mexico came in July, just a couple of weeks before Napolitano’s visit. On July 9, the Brazilian newspaper O Globo disclosed a vast array of U.S. espionage operations in Latin America, including those targeting the emails and online chats of Mexican citizens to gather information on the Mexican energy industry and the drug trade. At the time, Mexico’s response was mild compared to other countries named as targets for intelligence collection. The foreign ministry said it was seeking “broad information on this matter” from the U.S. government. Napolitano was the first U.S. cabinet official to visit Mexico after the espionage disclosures hit the press in early July and was given a set of “White House talking points” on how to address the issue in her meeting with President Peña Nieto. Those talking points have not been disclosed. Mexico’s readiness to move beyond the Snowden issue likely reflected its interest in addressing other policy issues, notably U.S. immigration policy and Mexico’s security infrastructure along both its northern and southern borders, themes found throughout the packet of briefing papers provided in response to the Archive’s Freedom of Information Act request. In September, journalist Glenn Greenwald published additional documents highlighting NSA eavesdropping on Peña Nieto himself, at a time when he was the leading candidate to succeed Calderón as president. Until recently, the Peña Nieto government’s response to the leaks has been considerably more muted than that of other foreign leaders reportedly targeted by the NSA. Brazilian president Dilma Rousseff has been notably more outspoken in her condemnation of the reported spying in her country and cancelled a state visit to the United States after the disclosure of massive NSA collection of Brazilian communications traffic, including Rousseff’s personal accounts. Now Peña says he will launch an investigation into U.S. espionage activities in Mexico, and Mexico’s secretary of foreign affairs, José Antonio Meade, has said that U.S. President Barack Obama has also pledged to investigatethe matter. Meade has also summoned the U.S. Ambassador, Anthony Wayne, for the second time since the scandal came to light. More than personal, it is an assault on the institutions of the country, given that it was done when I was the president… I will be following the steps the Foreign Ministry takes to demand explanations from the United States and the corresponding account of responsibility. The latest revelations offer considerably more detail on U.S. spying efforts in Mexico. Among other things, the NSA “has systematically infiltrated an entire computer network,” according to the Der Spiegel report, and in 2010 succeeded in hacking into the email accounts of Calderón and other top Mexican officials. The president’s office and staff had become “a lucrative source,” according to documents cited in the report. A 2009 spying operation called “Whitetamale” also unlocked the emails of officials from Mexico’s Public Security Secretariat, the ministry in charge of combating the drug trade and human trafficking.